19mar19-Most dangerous country to live in? THE PHILIPPINES is the most dangerous country to live in? It all depends on whom you ask, what your politics is, who is conducting the survey, and a host of other factors. Everything considered, my answer would be: The Philippines may not really be the most dangerous place to live in, but a feeling of insecurity hangs over it. The next question is, and I posed this on Twitter: So what do we do about it? That elicited varied responses across the political spectrum. A dual citizen suggested to have one’s passport and travel paraphernalia always ready. The usual crowd, however, kept baying at the Duterte regime running the country. The item that triggered the excitement was a study by Global Finance magazine which said that Iceland is the safest country and the Philippines the most dangerous. The study weighed up three factors: war, crime rates, and the risk posed by natural disasters. The study, written up by Anna Papadopoulos in Ceoworld magazine in January, also said the United States ranked 65 on the list of safest countries. China was at 81, Brazil 84, Israel 92, Mexico 105, India 106, Turkey 107, and Russia at 108. It noted that the most unsafe nations were ravaged by extreme experiences of war, crime and/or natural disasters — with the Philippines coming out as the most unsafe country, followed by Yemen, Guatemala, El Salvador, Nigeria, and Pakistan. Other countries that followed down the list of 20 dangerous places are Colombia, Bangladesh, Chad, Mali, Venezuela, Congo, Ukraine, Cameroon, Honduras, Burundi, Lebanon, Kenya, Jamaica and Cambodia. 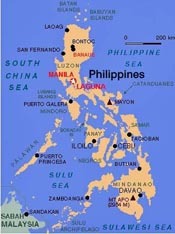 IF THE Philippines had land borders with neighbors instead of being a cluster of isolated islands in the Pacific, we think a great number of Filipinos would have walked out in search of the proverbial greener, and safer, pasture. Even now, about a tenth of the 105 million population are working abroad. Bless them, they are sending home some $2 billion monthly to sustain their families and help the economy sail on an even keel in troubled waters. For contingencies, the suggestion to have a passport ready makes sense. It costs only P950 (regular, 12-day processing) or P1,200 (expedited, six-day processing) if applied for in consular offices in Metro Manila, and seven days if in offices outside the metropolis. Since a passport has a 10-year validity (five years for minors), it will be handy if a situation arises, such as one’s finding a better job abroad, that will require producing travel papers quickly. Locally it is a solid government-issued identification document. Psychologically, having a passport keeps alive one’s yearning to find more rewarding employment abroad. It is also useful for those who may suddenly have to escape the dangerous environment developing in the country. THE CEOWORLD article cited in social media about the Philippines being most unsafe quoted a 2019 study by Global Finance magazine. As we write this, we have not come across any reaction from the Duterte administration. A similar report in Forbes magazine for 2018 was kinder to the Philippines, ranking the country No. 11 instead of No. 1 on its list of most dangerous places to live in. Instead, it ranked Brazil as the most dangerous country. The older Forbes report was based on a 2018 survey (it could now be dated?) of 18,135 expats living in 187 territories and countries. It provided insight into the quality of life and cost of living in key capitals. One subcategory on safety and security (part of the quality of life index) consists of three factors — peacefulness, personal safety and political stability — which respondents rated. The results were then collated to create the global ranking. Tatang Dik, are we to believe that alleged survey? Where are the so-called ‘war-torn countries’ on the list of dangerous countries? Iran, Iraq, Afgnanistan and yes even Syria is not on the list. Is it due to the fact that there are no expats there? Just wondering.